And Barney Oldfield, greatest racer of his day, was there! Few knew at the time: Barney's ever-present cigar was there to cushion his teeth on bone-rattling rides around rough dirt tracks. Oldfield at the wheel of Tacoma Speedway pace car. Continental drift? Apparently, Mt. 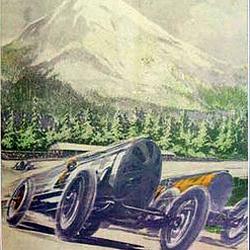 Rainier was much closer to Lakewood when this 1921 poster was made. Students hurrying to their classes at Clover Park Tech may not know it, but they're far from being the first to race across campus. A hundred years earlier, in a scene hardly conducive to study, the peaceful prairie surroundings were rent by the roar of engines, the air choked with clouds of dust churned up by countless spinning, skidding tires. For ten years, from 1912 to 1922, the site of today's college was home to the Tacoma Speedway (located in the heart of Lakewood, despite its name). At the time, it was one of only two Class A auto race tracks in America. The other played host, then as now, to a little competition called the Indy 500--which gives some idea of how important a stop Tacoma/Lakewood was on the racing circuit of the day. In fact, until the Seattle Supersonics basketball team won the NBA championship in 1979, historians considered the races held there to be the biggest thing ever to come out of the Northwest sports scene. 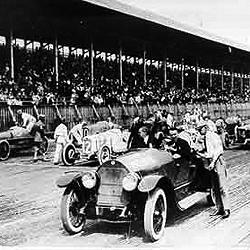 With its huge (by the standards of the day) purses and nation-wide exposure, the Speedway attracted the most famous figures in auto racing--including a man whose very name had been incorporated into a catch phrase shouted at speeding drivers all over the country: "Who do you think you are? Barney Oldfield?" Small wonder, given how Oldfield, a highly-successful bicycle racer, had torn up the tracks once he abandoned leg-power for horsepower. He burst on the national scene in 1903, in the earliest days of auto racing, by becoming the first man in history to sustain a speed of 60 mph over an entire mile in a vehicle powered by an internal combustion engine. 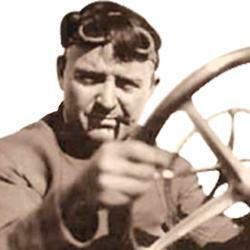 It was just the first of many speed records Barney shattered over the years--in 1914, for one, he became the first person in Indianapolis history to run a 100 mph lap. His daring, even reckless feats behind the wheel of "Old 999", Henry Ford's first race car—never braking on curves, for instance, just sliding through them like a motorcycle racer— had earlier made household names of both he and Ford. However, an ironic fate befell this man whose name had become synonymous with "auto racer": throughout the prime of his career, Oldfield was barred by the American Automobile Association from competing in its sanctioned events. For he'd been unable to resist the lure of the "outlaw" racing world, too often taking part in its reckless free-for-alls, usually held under unsafe conditions on rough backwoods roads. Despite his enforced absence from big-time racing, Barney still managed to make a very good living from barnstorming exhibitions, match races, and even from appearances at sanctioned events--in a non-racing capacity. Sponsors were quite willing to pay him top dollar for lending his name and prestige to their races, even if he couldn't take part. This was the case, in fact, when he drove the pace car at the Tacoma Speedway in 1922—that's him behind the wheel in the middle photo at right.